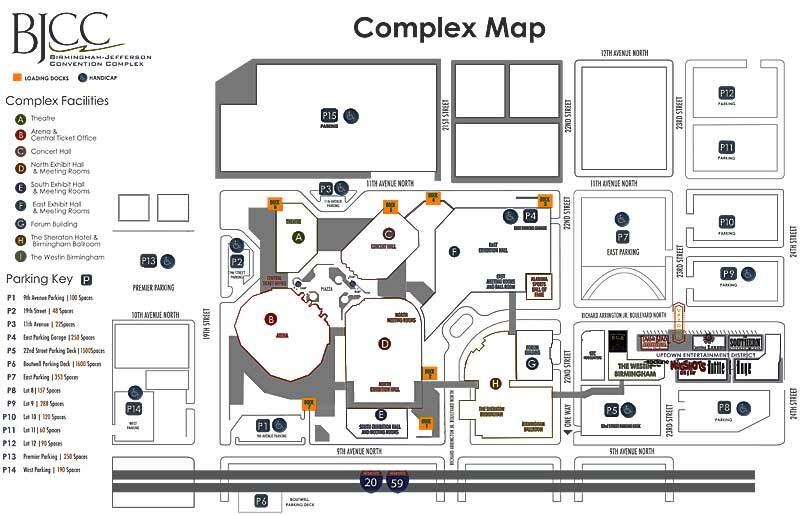 For the Arena and Concert Hall - take the 17th Street exit (125A) and turn left on to 8th Avenue (first light). Take left on 19th Street, go under the interstate and the Arena and Concert Hall are on the right side of the street. For Exhibition Halls, Meetings Rooms and Sheraton Birmingham Hotel - take 17th street exit (125A) and turn left on to 8th Avenue (first light). Proceed on 8th Avenue to Richard Arrington Jr. Blvd North. Take left and go under the interstate. The Sheraton Birmingham Hotel and Medical Forum are on your right, Exhibition Halls and Meeting Rooms are on your left. Option two - Go straight at the bottom of the ramp. Proceed one block to 23rd street. Take a left, go under the interstate and proceed one block to Richard Arrington Jr. Blvd North. and take a left. Take 11th Avenue exit from I-59/20 west (126A - not on map). Stay to right on ramp and circle to the end of the ramp at 25th Street. Take right on to 25th Street go one block, then take a right on to Richard Arrington Jr. Blvd North. Go three blocks. Take 22nd Street exit from I-20/59 west (125) At bottom of ramp go straight across 22nd Street. At the next intersection take a right on to Richard Arrington Jr. Blvd North. The Sheraton Birmingham Hotel and Medical Forum are on your right and the Arena, Concert Hall, Exhibition Halls and Meeting Rooms are on your left. Take Carraway Blvd. exit. At the second light take left on to Richard Arrington Jr. Blvd North. Go four blocks.